For the last decade I have immensely enjoyed this occasion. It provides the opportunity for me to gather with colleagues, friends for many years, and to reflect upon some of the major developments at Dartmouth and my perspective on matters that affect us. Even though we have had some difficult circumstances in a few years, the trend has clearly been a positive one. That continues to be the case — even as we convene in the midst of a major international financial crisis. No institution and none of us is unaffected by this. But the good work goes on. What I will call our true endowment is focused and healthy. This culture of faculty doing exceptional work and enthusiastically advancing an intimate learning environment marked by student-faculty collaboration resists all challenges. As a historian and as a participant in 40 years of Dartmouth's history, I have a particular perspective on this. Let us understand up front that the state of the College is good and strong. Dartmouth is dependent upon the quality and the intellectual energy of faculty and students. Each day your accomplishments and those of our students — undergraduate, professional and graduate — affirm that the enterprise is on course. To be sure, current economic conditions make our course a bit stormy right now. But strong and enduring institutions are accustomed to weathering stormy conditions. Let me summarize some of the major accomplishments and goals of the Faculties. In the Arts and Sciences it has been my privilege to work with Dean Carol Folt. She has engaged with faculty and her team in strategic planning that raises our ambitions and has been an indefatigable fund-raiser who represents Dartmouth's academic values well. Over the last decade we have undertaken a period of unparalleled faculty and program growth. I have read every promotion, tenure, reappointment, and endowed professor recommendation from Arts and Sciences for 20 years. I have met most of the new faculty who have joined us, at whatever level, and I can affirm that the faculty has never been stronger. I am pleased with the intellectually exciting initiatives in digital humanities, sustainability, computation, international and global studies, and ethics, among others that have emerged from the faculty in the last few years and which cut across departments and divisions. We also have seen a major growth in the social sciences and other departments that have dealt with the greatest enrollment pressures. These departments have become world-class in their academic reputations. We are looking to initiate new off-campus programs in India, Tibet, and Central America and to strengthen our work in Africa. The off-campus programs are an essential part of the Dartmouth educational experience. None of our competitors is even in our league in this regard. As one who reads student surveys and receives quite a bit of student and parent feedback, I would simply like to thank the faculty for their work. The commitment you have to working with students one-on-one, meeting with them out of the classroom, and caring about their growth as individuals, defines Dartmouth. By every metric, the number of independent credits, theses completed, and returns on student and faculty surveys, student-faculty collaboration is only getting stronger. Your students value you. Dean Paul Danos has provided exceptional leadership at the Tuck school since 1995. Over the past few years, Tuck has set records on most factors we measure: the quality and diversity of applicants and the entering student body, employment opportunities and starting compensation for graduates, publications by faculty in refereed journals and leadership in their fields, annual and capital giving, and wide recognition of the excellence of our MBA program. We achieved our initial $110 million goal for Tuck in the capital campaign and are now expanding our effort to raise funds to support a further expansion of the size of the Tuck faculty. Expanding the faculty without increasing the size of the student body is one of the goals laid out in the five-year strategic plan that was approved by the Tuck faculty in June 2008. In December we will open and dedicate our new living and learning facilities (Achtmeyer, Raether, and Pineau-Valencienne Halls), and we will soon renovate Buchanan Hall for use by faculty and for executive education programs. Dean Joe Helble hit the ground running - and he hasn't stopped a bit. He and the Thayer School faculty have settled into new facilities and have worked hard to develop some exciting strategic initiatives. I am delighted that they have moved ahead with a new exchange program for AB students with Chulalongkorn University in Bangkok. This represents the first foreign study opportunity in engineering for undergraduates. Thayer has completed new faculty appointments in the key area of engineering in medicine. Now Dean Helble and the Thayer faculty are focusing on hiring in the area of energy, which will be a field of strategic growth. The school has seen record numbers of applications to the Masters of Engineering Management and the MS/Ph.D. programs. This past summer Thayer initiated an Innovation Track within its Ph.D. program, with an enrollment of four talented students in its first class. We believe this is the first explicit program of its kind in the country. We were delighted to learn that we have just been awarded a Luce Foundation award in support of Ph.D. fellowships for this program. I want to thank Dean William Green for stepping up to assume leadership at the Dartmouth Medical School. This is a difficult time for medical research due to the decline in NIH funding. Nonetheless, the Medical School faculty continues to compete with exciting initiatives that help to drive the growth of interdisciplinary science at Dartmouth. I would like to congratulate Dean Green and his colleagues for the major effort that has now resulted in a Clinical Translational Science Award proposal to the NIH that will fund efforts cutting across DMS, Dartmouth College, the Hospital, the VA, as well as other locations. If the grant is funded, it will have a significant effect on the medical center and its future directions. The DMS faculty is moving ahead with plans for improvements to the medical student curriculum - specifically in clerkship offerings for year three of medical school by the recent affiliation with California Pacific Medical Center, and new elective offerings in the third and fourth years. Dean Folt has recently appointed Professor Brian Pogue of the Thayer School as dean of graduate studies, and we are delighted that he has taken on this responsibility. 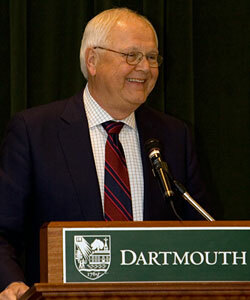 He succeeds Professor Charles Barlowe of the Medical School, and their leadership in this role underlines that the Office of Graduate Studies at Dartmouth has responsibility for all of the non-professional Masters and Ph.D. degree programs in Thayer and DMS, in addition to those in Arts and Sciences. These programs have grown significantly in the last decade, with the largest growth occurring in DMS and Thayer and in interdisciplinary programs linked with Arts and Sciences. The total and the quality of the applicant pool continue to improve, and international students are critical participants in several of the programs. Last year Dartmouth awarded 81 Ph.D.s, the largest number ever. The strength of the faculty and the programs summarized above give me tremendous confidence in the future of the College and allow me, despite some economic pressures, to affirm that the state of the College is strong. The academic leadership, the Deans and their associates and Provost Barry Scherr and his colleagues, enables the strength of the faculty. Before commenting on the economic situation, let us acknowledge and then move beyond the fact that the College is in a period of presidential transition. Transitions can be unsettling times, marked by both uncertainty and the excitement of anticipation. My best advice is not to dwell too much on the uncertainty but to enjoy the excitement. I have been through this before: I have seen four presidents complete their service — and when I was full time in the faculty, as I was for the first three transitions, I can't say that it had any immediate impact upon my work. The good work of the academic enterprise continued and thrived, despite comings and goings in Parkhurst. And so it shall in this period. Let me share a few personal reflections. I came to Dartmouth as an assistant professor of history in 1969, with a new Ph.D. President John Dickey was completing his 25 years as president, and the search for his successor was well underway. Dartmouth faced some profound questions: When and how would Dartmouth become a coeducational institution? How could we welcome more students of color (then a concept that was not much broader than African American students)? How could we insure that the faculty and the staff mirrored our ambitions for the diversity of the student body? Could we expand and strengthen the faculty? How could we incorporate our historic professional schools — then still called "associated schools" — more directly into the academic life of Dartmouth? The Dartmouth that I came to in 1969 was a school with 3,200 male undergraduates, with probably fewer than 10 percent students of color and some 90 international students, the majority from Canada and Western Europe. Dartmouth was on a conventional nine-month calendar, with Saturday classes. There were a few off-campus language programs. Tuck still counted among its students many Dartmouth graduates. Thayer was a small program that essentially focused on undergraduate engineering majors, and the Medical School was a two-year school, also dependent upon Dartmouth undergraduate applicants. Most faculty lived in Hanover. It was a time of cultural and political change, marked by great protests against the war in Vietnam. When I drove out from Madison, Wisconsin to Hanover in mid-summer 1969 I saw hitchhikers going to the concert at Woodstock in New York. It was a time of U.S. hegemony. World currencies were fixed on the dollar, which was in turn fixed on gold. Petroleum was cheap, and energy was inexpensive. With the civil rights and the women's rights movements, American society was confronting the gap between the promise of American life and the reality of the experience for many. Massive anti-war demonstrations rocked US campuses. Following protests here, Dartmouth suspended classes and largely closed down for the last month of my first year at the College. The legal drinking age in 1969 ranged from 18 to 21 (depending on the state), and in any event the social attitude toward alcohol — and in some ways even drug-consumption — was casual and permissive. Colleges, including Dartmouth, had recently suspended parietal rules — in loco parentis was shelved. There was little discussion here or on any campus about accommodating physical disabilities or emotional problems, and there was not much counseling to assist students dealing with issues of addiction, depression, sexuality and sexual orientation. Few had even thought about learning disabilities and eating disorders, and there was little sense of institutional responsibility at Dartmouth or anywhere else for assisting students with these issues. Faculty largely spent the day in their offices or laboratories and were avuncular advisors to students on all matters, academic and personal. Computing was in its infancy, and digital security was not even part of science fiction vocabulary. What I did not realize at the time was that the College was in a difficult economic situation. Dartmouth experienced its first deficit in 20 years in 1967-68. The gap between revenue and expense grew over the next several years. Partially this was the result of a decision in 1967 to provide more financial aid support for students and a commitment to improve compensation for faculty and staff. Perhaps most importantly, the deficit resulted from a downturn in the value of the endowment, following a significant decline in the equities market. The College met the budget deficit by allocating "quasi-endowment" principal to meet the needs of the operating budget. This all provides support for an observation of mine: In the history of American higher education, lean years have been the norm more than years of growth. I will not belabor the obvious contrasts between the College and the world in 1969 and our situation today. I would simply observe that Dartmouth is a far richer, less homogeneous place, one that operates around the year and around the world and one whose affiliated schools have become exceptional professional schools. Dartmouth functions now in a world that is far more laden with governmental regulations and demands, with a range of compliance restrictions, with governmental oversight defining some basic relationships between the College and its students. The long list of compliance and reporting requirements included in the Higher Education Reauthorization Act is just the most recent example. Increasingly individuals consider litigation as a natural remedy for disagreement. We are part of a global society and are subject to the patterns of a global economy. Information technology has transformed how we work and communicate with each other. We live in an exciting time, and we must not allow the problems of our generation to impede the education of the next. Over the last 40 years we have seen the endowment grow significantly so that it provides support for an increasing proportion of the budget. This has been the result of remarkable generosity from graduates and friends and from professional management of the endowment so as to maximize returns. Over the last ten years our endowment performance has been among the top quartile of comparable schools. This past year, although we still had top-quartile performance, was not as good as we had hoped: We were marginally positive in the fiscal year ending June 30, and in the quarter following that we have been down several points. The immediate impact here is that under our endowment distribution formula, we have less revenue than we projected this year and are likely to have still less next year — and this despite the fact that we do have a comparatively aggressive endowment spending formula. We will discuss this situation with the Board of Trustees at its upcoming November meeting, and following that we will initiate measures to reduce expenses. We will consult with the Faculty Committee on Priorities, with the Student Budget Advisory Committee, and with other groups and individuals about the potential steps we will take. As we begin this process I would like to make clear my view that Dartmouth does not have patterns of discretionary spending that can easily or harmlessly be ratcheted back to meet new budget goals. We will take the steps that are necessary, but it might be useful first to take a step back in order to assess those things that define and enable the College. Over the last decade I have spoken on a few occasions about my concept of the Dartmouth endowment and made clear that I thought of myself as a teacher, an educator, and not an investment banker. I noted at the outset of my administration that I would not assess the accomplishments of my service as president based simply on how large the endowment became. Clearly we all want a larger endowment — that is a good thing. But a larger endowment is not an abstract benchmark, but rather it is a means to advance priorities and purposes. The financial endowment, the bank account, is a remarkable asset that must serve both the current work of the College and provide a trust fund for future generations. We have at times spent it more aggressively than at other times. And we have often tipped more in favor of accumulating assets for future generations — as all growth returned to endowment beyond the rate of inflation does. I have supported the Board's recent move to an increased level of spending, because I define Dartmouth's true "endowment" more broadly than this wonderful financial resource. As we consider our responses to the economic downturn, I would urge everyone to remember that the true endowment of Dartmouth, the legacy for which we are all responsible and accountable, has to do with the overall strength of the College and its capacity to meet the changing needs of a changing world. This is a far richer and more complicated asset than the size of our bank account. At the core of this true and comprehensive endowment is the quality of the faculty. We need to protect Dartmouth's ability to recruit, retain, and enable the work of faculty. The formula to protect the faculty as Dartmouth's endowment is really quite simple: First, provide competitive compensation, and I include with this the support that enables excellence in scholarship and in teaching. Second, work to grow a diverse faculty that will always position us on the boundary of new fields of study that are critical to our academic interests. Finally, provide our students with opportunities to study their areas of interest with faculty who care about them. This is the Dartmouth story. Over the last ten years we have been resolute in growing the faculty and in bringing our compensation up to a competitive level with our peers. We have done this through a recruiting policy that seeks to appoint the very best young faculty and a judicious recruitment of senior faculty to provide ballast and leadership in selected areas. Doing both of these things simultaneously, expanding the faculty and increasing average compensation, is difficult and expensive, and we need take pride in the accomplishment. But the most compelling is the quality of the faculty. You are the individuals who are defining your fields, and you have maintained Dartmouth's clear commitment to strong teaching and mentoring. This quality, it should be clear, marks the graduate schools as it does the undergraduate programs. Over the past decade we have grown the Arts and Sciences faculty from 380 to 439 FTEs, and in the same period have moved the undergraduate student-faculty ratio from 10 to 1 down to 8 to 1. Over the course of the campaign, generous donors have endowed 19 new professorships and established 66 new endowment funds in the Arts and Sciences. Since 1998 Tuck has increased its faculty lines from 37 to 55. Thayer has also expanded its faculty, from 36 in 1998 to 46, in keeping with new strategic areas of focus. And DMS has undertaken a period of selected growth in emerging areas of medicine, notably in genetics, molecular and cellular biology, cardiology and in cancer research and treatment. The companion piece of the faculty as endowment at Dartmouth is the quality of the student body. I can affirm that Dartmouth has always attracted students who are among the most accomplished academically and the most creative and interesting of their generation. These qualities are each important in providing a Dartmouth education. In order to attract our first choice of students we need to provide financial aid that is both competitive and enables all students to enjoy the full range of opportunities that are part of the Dartmouth educational experience. During my time as president we have announced three separate initiatives to enhance our financial aid program. The latest, announced earlier this year, eliminates tuition for students whose families earn less than $75,000 annually, substitutes grants for loans as part of the financial aid package, introduces need-blind admissions for all international students, and provides additional funds to relieve one summer's earning expectation. In the current year, Dartmouth will provide $65 million dollars in scholarship aid, more than double the amount we funded in 1998. The Board and I also made a commitment to invest in the out-of-classroom experience for students. We sought to provide more on-campus housing and dining options and to increase the range of social and recreational opportunities. We have built nine new undergraduate residence halls and renovated several others, expanded late-night programming options and leadership development programs, subsidized student tickets for Hopkins Center performances, supported a growing club sports program, and made student admission to athletic events free. Additionally, in the last decade we have either replaced or extensively renovated almost every athletic facility, providing greater access for club sports and recreational fitness. I have affirmed our clear commitment to competitive intercollegiate programs within the Ivy model and to the broader role of athletics and the out-of-doors experience in advancing a Dartmouth education. We all will celebrate the upcoming centennial of the Dartmouth Outing Club. Finally, the College has worked closely and positively with the coed/fraternity/sorority leadership so that today their role in the community is far stronger and more positive than it has been in the time I have been here. We have worked with them and with other student leaders to create a stronger and more inclusive community. This is a wonderful student body at Dartmouth. They are committed to learning; they assume responsibility for the College; and they will make a difference in the world. Early returns suggest that applications for the Class of 2013 are running ahead of last year's record numbers. The economic situation will make this a complicated year in admissions. Students and faculty are the energy that powers the true Dartmouth endowment. Any steps backward from our commitment to recruit, retain and enable the very best students and faculty would present a far harder problem to correct than a market downturn. The competitive world of recruiting the very best students and faculty is hard on those places that have faltered. The diversity of this community enhances the energy and excitement that mark our work. There is a third element in the endowment of Dartmouth that I would mention here - our graduates. President Ernest Martin Hopkins referred to alumni as the "living endowment" of the College. They still are. The $42 million they provided last year in the Dartmouth College Fund represents the equivalent of $800 million of unrestricted endowment. Alumni/ae are the key contributors to the $1.1 billion we have raised so far in the capital campaign. Some 67% of living alumni/ae have participated. This is a wonderful story, but there is more to this living endowment than simply contributing money. Alumni volunteers are critical to recruitment of students and to working to support our graduates. They provide service and advice to a range of our programs, academic and extra-curricular, and they keep the Dartmouth brand alive and well in the broader world. We need to acknowledge that many alumni have been concerned about the Board's governance decision a year ago. I respect that — as I repeat that I believe the Board did the right thing. Even if there is disagreement on Board action, a strong majority of alumni who participated in the election last spring did not support a lawsuit against the College. We need to work hard to reaffirm and rebuild our relationship and faculty are critical to this. These are your former students, and they take confidence from knowing that you are here doing the good work of Dartmouth. There are other elements that comprise the true endowment of Dartmouth that I would like to include in this conversation. One has to do with the physical endowment. This is a lovely campus, one that is inviting and human in scale and one that seeks to have facilities that enable the strongest faculty and the strongest students to do the strongest work. We are careful here to address deferred maintenance needs, even if we sometimes are more patient than we wish to be with deferred renovation. We have engaged in a significant period of construction over the last several years, and in doing this have met some needs that were identified years ago. In the last ten years we have invested over $1 billion in facilities. In addition to the student life improvements mentioned earlier, the greater investments have been in academic facilities, both new construction and substantial renovation. They have enriched your work and enlarged our capacity. We have also completed a number of projects at the hospital campus and in Centerra Park, and have renovated and added faculty and graduate student housing. Finally, the true and comprehensive endowment of Dartmouth includes a remarkably committed administrative team. The officers and staff who serve Dartmouth protect and advance the other components of the endowment — the students, faculty, alumni services and development, plant, and the financial support system. They provide an operations and service culture that cares deeply about Dartmouth. They reach out to a diverse student body in a complicated world. As I have said on other occasions, it is most unfortunate that they have sometimes collectively become targets of uninformed critics. We are, in fact, thinly staffed for our commitment to quality of service, our expectations for the quality of the physical environment, and the systems management, compliance and monitoring demands that mark Dartmouth today. I am proud to serve with this group of colleagues. The traditional endowment as bank account may provide the lubricant for the larger true endowment. We cannot sustain operations without the financial support it provides. But we should never confuse it with our purpose or imagine that it defines our values. Last year at this meeting I outlined for you several objectives that I hoped to reach in the remainder of my term as president. I proposed that we enhance the financial aid system to make certain that a family's economic situation was not a barrier to student enrollment at Dartmouth. I promised to continue the growth of the faculty. I endorsed the plan of the Arts and Sciences faculty to establish a program in writing and rhetoric. I urged the development of a program to enable Tuck school faculty to offer some selected courses for undergraduates. I advocated a discussion of ways we could enhance the summer term academically. I made clear my hope to move ahead with some of the major facilities projects that were still pending. Finally, I promised to help conclude the Campaign for the Dartmouth Experience. One year later we have accomplished most of these goals: The financial aid program, the writing and rhetoric program, and the Tuck teaching program are all underway. We broke ground on the Class of 1978 Life Sciences Center. Dean Folt and a faculty committee are reviewing summer term academic initiatives, and Provost Barry Scherr and the directors of the academic centers and institutes are considering some summer activities. The capital campaign needs $171 million to reach its $1.3 billion goal. This is a remarkable accomplishment, and we need to recognize that raising the remainder will be difficult. We surely will do it — but perhaps not as quickly as we had hoped. In the near term many of our generous donors will not be able to provide financial support as much as they wish to do. This will result in the delay of some of capital projects previously announced and in the planning stages. Consistent with our past policies we will not authorize projects that do not have a full funding plan established. In these economic conditions, putting these funding plans in place will simply be more challenging. We will review with the Board controlling additional debt except for advantageous refinancing of current obligations and for projects underway or for those required for basic renovation and for safety and code issues. Over the next several months we will need to reduce significantly the growth in expenses. I will want the senior officer budget group to consult widely and develop recommendations to bring to me. At the outset I wish to make clear my priority is to protect our financial aid program and our competitive faculty compensation objective. We will need to reduce payroll projections, but I hope that the need for reduction in force will be accomplished through attrition. I surely had not wanted to spend my last year overseeing expense reductions! There is, however, a certain symmetry to this — when I entered the senior administrative ranks 20 years ago as Dean of Faculty, we early on faced budget shortfalls. I also appreciate now that this is a periodic, even cyclical, thing — not intending by this description to minimize the serious economic circumstances today, which do have few historical precedents. Great and enduring institutions, as we are, survive these downturns better than most — as we shall. We will do this by remembering the component parts of the true endowment of Dartmouth. These are what we must protect. I will probably not meet again with you in this forum, as the General Faculty, and if we do it will not be for me to make an annual report. So let me simply say that it has been a privilege and a personal pleasure to preside over this body. My annual reports have essentially involved affirming your strength and your good work. This has been easy! We have several months to work together and then Susan and I do not intend ever to be too far away. Thank you for your friendship and support. And thank you for all you do for Dartmouth.